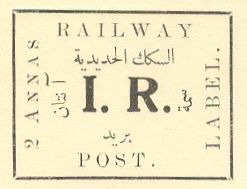 Iraq Railway stamps, not much is known about them and they are very rarely collected. Most likely reason being since they are almost unknown to collectors. With these pages I try to make other stamps collectors aware of them, maybe some collector are having such items in their duplicates, unaware of what the have. I am thankful for any information you might have regarding these stamps and their usage. February 11, 2019. My Iraq Railway Stamps 1923-ca.1948 Exhibit has been added. October 18, 2015. New "reprints" of the stamps from the 5th. issue noted. Since there are no official reprints these stamps must be considered as forgeries. September 22, 2015, newly discovered complete booklet of RP-1 added. September 22, 2015. 2 new pages for cliché details of stamps RP-1 and RP-2 added. Cliché details will added shortly. June 5, 2015, another cover from HINDIYAH added. May 5, 2015. A cover from Tubat added. April 22, 2015. Time Table No. 55 of November 1933 issued by Iraq Railways added, furthermore three Advertising Posters issued by Iraq Railway added. December 13, 2014, some formatting errors, caused by the layout change, have been corrected. Furthermore, a new sub-menu item under "Miscellaneous" for Images and Photos showing Railway Stations has been added. While photos and images of smaller station with very limited picture material available, larger stations may justify a separate page. The first page created is for Baghdad West. June 16, 2014. Added a question on addresses used on Iraq Railway Covers. May 26, 2014, Started to implement modified layout. January 4, 2014 List of Railway Stations / Halts has been modified and redesigned. A new Submenu "Miscellaneous" has been created with some content already added. August 2, 2013, colored images of booklet covers from the RP-1 and RP-5 stamps were added. August 2, 2013, a cover from Baghdad North to Khanaquin. August 2, 2013, a stamp with postmark of Qaraghan has been added. The first copy of the Qaraghan postmark known. November 6, 2012, a complete booklet pane of RP-1 with variety "upper stamp with No Periode" after label has been added. March 17, 2012, Fragment with RP-2 and postmark of Sumaicha has been added.